I love these joyful beads! 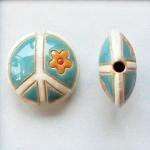 Great teal and orange combination peace sign focal bead. These beads are handcrafted in Bulgaria by Golem Design Studio. Bead measures 23mm in diameter with a 3mm hole. So cute. Jasmine Tea Designs never disappoints.